Kelley Elizabeth Rogers of Westerly, Rhode Island grew up spending most of her time in the City by the Sea with her Newport native father. They would visit her grandparents and cruise Ocean Drive, eat fried clams, and on Saturday nights you could find them at mass at St. Joseph’s Church. 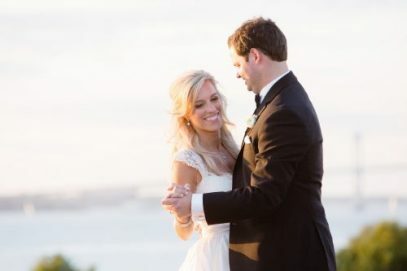 She recalls telling her grandparents over one of their clam dinners that she would be married in Newport one day. 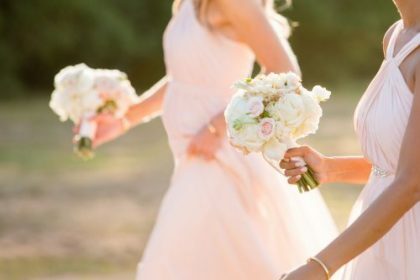 Fast forward to 2011, Kelley met Martin O’Brion Jr. of Portland, Maine while collaborating on a work project, but little did she know that he would soon make her childhood dream come true. 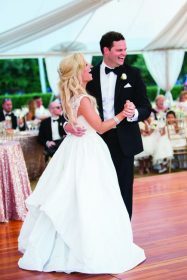 In 2016, Kelley’s classic and timeless lifelong vision came to life at the Eisenhower house, and although her grandparents weren’t in attendance, Kelley is certain they were there in spirit. Later on in the evening, the couple had a pianist come to initiate a sing along session. Marty surprised the crowd with a special rap performance of “See You Again,” to liven things up. 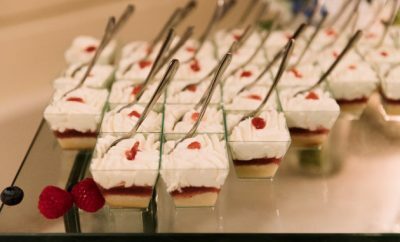 They also offered dessert libations like adult root beer floats and Boston cream pie martinis to keep the party going! The entire wedding party wore black and white anchor socks to complement their tuxedos. Marty and his best man wore spectator shoes to stand out, mirroring Marty’s father who wore them in the 70’s. 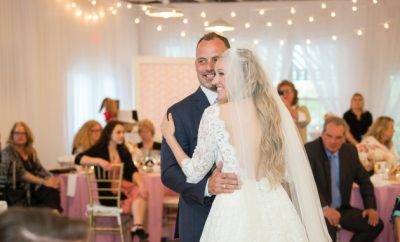 To the couple’s surprise, the bride’s mother commissioned a painter to capture the first dance, which provided them both a custom work of art and a piece of wedding memorabilia to hang in their home. 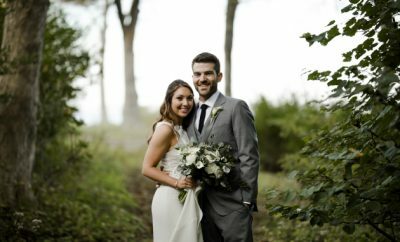 After honeymooning in Italy, they settled back down in Franklin, Massachusetts where Kelley is the director of marketing and Marty is a marketing manager at CVS Health.